That would be the weather were Vettel has consistently come unstuck but we will write that off to Ferrari? Mercedes needing to be rescued by the weather doesn't change the fact that the Ferrari was intrinsically the faster car. Who said the word dominate it's a mere measure of which car was quicker and so many articles point that to be Ferrari. Because they have the tools to do that which we don't have, so your basic argument is who can judge accurately which is the faster car whilst you yourself feel fully equipped to judge which is the faster car. Why the need to use the word dominate which nobody said? The premise though is which car has been more often better, there is the evidence provided and then there is people who think they know better. You presented the Amus figures in a way that suggested they couldn't be questioned. However, Wolff's comments illustrate that even the experts don't necessarily disagree. That's the only point I'm making by using him as a reference. It's not about him being right and them wrong, it's about illustrating that Amus' opinion isn't necessarily the be- and end-all. Silverstone just happened to be a clear cut case demonstrating the difference between them. But I'm not using the rankings or Wolff as a barometer for my opinion. I prefer to look at the races and form my conclusions from what actually happened. And I'm afraid I don't always agree with the experts, not least because the experts don't always agree with each other anyway. Which experts don't agree with one another, all of a sudden Wolff is an expert until he says something you don't agree with I would be guessing? So one thing Wolff says about one particular race is all you need to basically rubbish various articles that disagree with your opinion? Fair enough, I think it's wrong terminology as it suggests a sizeable gap. It's not just AMUS though it's numerous sources, there are people that still believe the world is flat, I'm sure they think it's contestable as well, so apart from Wolff and Silverstone, that being one race, what sources do you bring to the table that encompasses the season? It's pretty absurd to suggest that the team principle of one of the teams being talked about is not an expert. That doesn't mean I (or you, clearly) am going to agree with him all the time, but he knows more about Mercedes and their car than this entire forum put together. He's the definition of an expert, far more so than Anderson - who in my opinion is a pretty solid has-been who writes dubious articles like calling for qualifying to be scrapped and replaced with a sprint race. It's still only one race being used to discredit a season plus Anderson is not the only source, also what has his personal opinion about the way forward for F1 got anything to do with this? Why is what Hamilton has said which encompasses more than one race being ignored, you have one source that mentions one race, that's all. It still exposes the AMUS numbers as the guesswork it is. I'm not ignoring what Hamilton said, and I don't think anybody else is, either. The point being made is that multiple expert sources do not agree, and as such the supposed consensus among experts that you're pointing to doesn't exist. BTW, Toto wasn't talking about one race. He explicitly mentioned the entire triple header. It supports the current 9-8 score on the season, and also makes clear that there has been an ebb and flow over the year to date. Ferrari generally had the faster car up to Singapore, but not by a large margin except for two or three races. The Mercedes advantage in Australia, France and Austria is as great as the Ferrari advantage in China, Monaco or Germany - and amusingly enough, neither team won a majority of the named races in their favor. Ignoring the arbitrary distinction of 'up until Singapore', it's clear on that chart that - while the score has evened out at 9-8 - the advantage is heavily with Merc at the moment. By the end of the season, there's a very good chance that the Mercedes will have been the better car over the whole year. 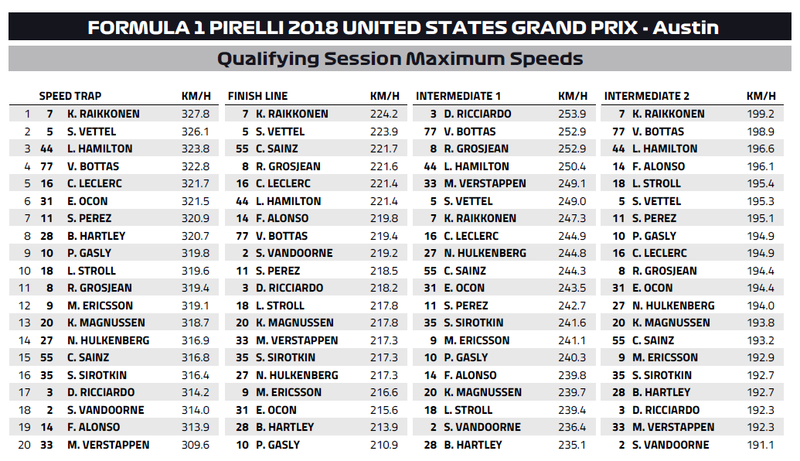 I think this data further reinforces Sandman/Pokerman's major point - that Hamilton had put himself in a strong position during a period when Ferrari had the stronger car more often. By Italy, Hamilton had already established a comfortable points lead, despite a DNF and multiple reliability issues(while Vettel remained bullet-proof). 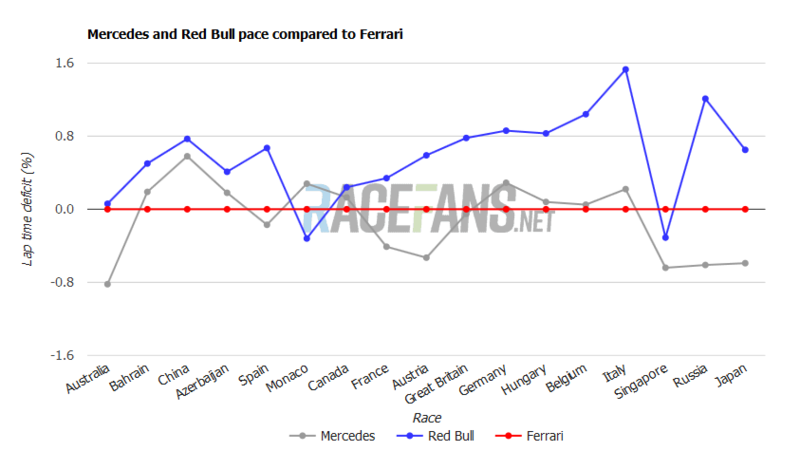 According to this graph, upto and including Italy, Hamilton only had the quicker car 5 times, Vettel 9. Last edited by aice on Wed Oct 17, 2018 7:53 pm, edited 1 time in total. I think this data further reinforces Sandman/Pokerman's major point- that Hamilton had put himself in a strong position during a period when Ferrari had the stronger car more often. By Italy, Hamilton had already established a comfortable points lead, despite a DNF and multiple reliability issues(while Vettel remained bullet-proof). According to this graph, upto and including Italy, Hamilton only had the quicker car 5 times, Vettel 9. But nobody's denying that major point. Everyone agrees Hamilton has out-driven Vettel, and that Ferrari was generally the stronger car early. That broad point is not in contention, it's the minutiae of where and how often Mercedes had the better car in the early season that is in question. Using GPS data is guesswork, really? The previous 2 races to Silverstone are excepted as Mercedes being quicker, also the last 3 races are excepted as Mercedes being quicker, so we are back to 9-5 going into Singapore with what you've brought forward from Racefans so that doesn't really change anything in respect to what I said, however I do appreciate the effort you put into your post. Is that still in question with you given what Autosport, Amus and Racefans have said? Not if everyone accepts that Mercedes was quicker in Silverstone, no. We started off with people claiming they didn't even have the best car at the triple header, which is what all this stuff about quoting Toto Wolff, etc. came from. The argument was with one poster adamant that going into Singapore the cars had been equal, Silverstone makes it either 10-4 or 9-5 to Ferrari, in the grand scheme of things how does that change Ferrari being quicker than Mercedes more often than not, Wolff is basically being used as a diversionary tactic. Ferrari back on top here? Thoughts? I gave qualifying to Ferrari, yeah. Haven't been able to really follow the weekend but I'm guessing there has been no particularly useful long running, but that doesn't necessarily translate to the race anyway. Looks to me like Ferrari got Hammed. It looks that way which makes the rest of the season interesting as it began to look like Mercedes had gotten on top of Ferrari. My take as well. This is a track Hamilton has dominated and Bottas was nearly four tenths behind. Ferrari look like they are back on form. In the race I expect something similar to Italy after lap 1; with Vettel dealing with traffic while Hamilton and Raikkonen battle at the front. As such, race pace will be impossible to discern. It begs the question of what exactly explains Ferrari's abysmal qualifying performances in Russia and Japan. It was said to be tyre related but Ferrari's extra speed on the straights seems to be back. Did the FIA remove that sensor? One possibility is that Mercedes had opened a gap, and Ferrari's upgrades actually worked for a change. Either way - while the championship may be over - this should be good for the rest of the season. And if Lewis has his usual post-clinch slump, the season might end up looking artificially close. Did they run their upgrades though? Merc already focusing on 2019? There's gonna be a long walk to next season. I read Ferrari took the upgrades off and both drivers felt the car was good. The power boost is back, interested to know how much time advantage Ferrari are making on the straights. I wouldn't know and I don't know if the two things are related to one another? No just a case of Ferrari's extra speed on the straights came back. Has anyone seen the comparison video of Hamilton and Vettel? The speed of the Ferrari on the straights is just wow, but Mercedes in the corners ie quality. Check the speed trap numbers. Finish line and the two intermediates are not on high speed sections of the track. Raikkonen has 4 km/h on Hamilton and Seb has 2.3 km/h on Lewis. Edit: Look at all of the Renault engined cars all the way at the bottom of the speed trap numbers! Hulkenberg is the fastest of the lot. Hartley and Gasly in Hondas are both right around 320Km/h and the fastest Renault is 316.9. There's something weird going on behind the scenes. It's as if the FIA banned something on the Ferrari and then allowed it back again now that the championship is pretty much over to prevent Mercedes from walking the last few races. I can't think of any other explanation, the change in Ferrari's competitiveness is much too big for it to just be circuit related. The only other time I can recall seeing such a dramatic and sudden performance swing back and forth was the sudden banning and un-banning of exhaust blown diffusers during 2011. Perhaps you are looking in the wrong garage for explanations? It's a rumour that Merc had to change the rims they introduced in Singapore.